The Paste tool places the image from the clipboard onto your page. 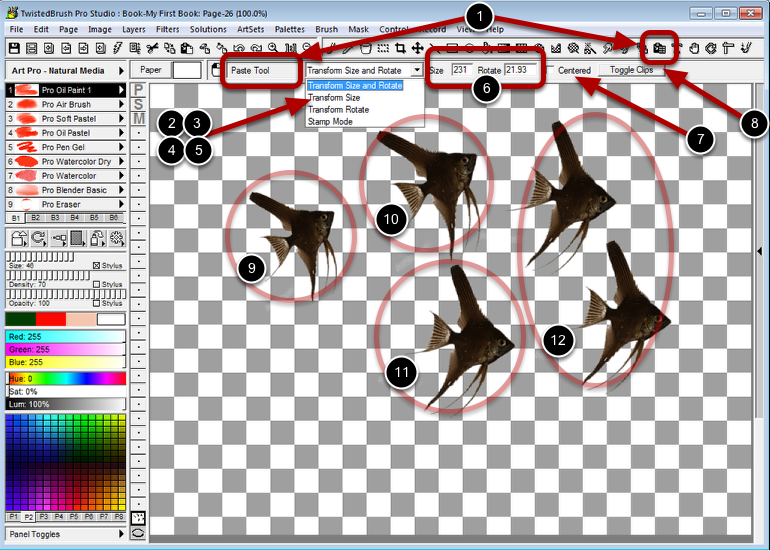 The Transform Size and Rotate mode allows you to scale and rotate the image dynamically as you click and drag. Press and hold the CTRL key to move the image to a different location. The Transform Size mode allows you to scale the image dynamically as you click and drag. Press and hold the CTRL key to move the image to a different location. The Transform Rotate mode allows you to rotate the image dynamically as you click and drag. Press and hold the CTRL key to move the image to a different location. The Stamp mode allow you to place the image in the last used size and rotation as you click and drag. The Size and Rotation fields both are indicators or the current size and rotation when placing and image you can also manually enter values here. If the Center option is checked the pasted image will be placed in the center of your page. The Toggle Clips button is for convenience to show or hide the Clips panel since it is common to use clips as a source of objects to paste. This image was placed with the Transform Size and Rotate mode. This image was placed with the Transform Size mode. Notice the rotation was the same as the previous usage. This image was placed with the Transform Rotate mode. Notice the size is the same as the previous usage. These 2 images were placed with the Stamp mode. Notice the size and rotation are the same as the previous usage.